Are You as Pumped about Pumps as We Are? Out of the three normal states of matter—solid, liquid, and gas—pumps can move the last two and pressurize the last one. Pumps not only force fluids to flow, but can also create a vacuum by compressing gas to a high pressure, evacuating air from a container. Pumps move fuel from your car’s tank to the engine. They also can dispense life-saving fluids from an IV bag into a patient’s veins. We at Providence have a lot of experience designing and assembling custom pumps for our customers who span across many industries: Industrial, Marine, Medical, and Food & Beverage to name a few. There are a lot of different types of pumps, but ultimately every pump is a device that converts mechanical energy into a fluid’s motion energy, or the potential energy of a pressurized gas. In this post, we’re going to highlight just a few of the fundamental pump designs we’ve manufactured for our customers. There are entire families of pump designs that utilize one or more rotating parts. That is convenient considering almost all electric motors output rotational mechanical energy, and that makes the coupling between the electric motor and pump very simple, resulting in a pump assembly that can be plugged into an electrical outlet. Here, we’ll discuss only one type of rotary pump: the rotary vane pump. A rotary vane pump contains a circular internal rotor that spins inside the circular pump housing, but the center of the rotor is offset from the center of the housing. The rotor makes contact with the pump housing wall between the inlet and outlet ports, thereby ensuring flow in only one direction. The rotor has vanes (walls, fins) that slide in and out, and maintain contact with the pump housing. These vanes are spring-loaded so that they are always pressing against the wall of the housing. The vanes also sweep the fluid and segment the flow into separate compartments with expansion happening at the inlet and compression occurring at the outlet. The rotary vane pump is popular for high-pressure hydraulic applications such as a car’s power steering and automatic transmission pumps. They can also be used in lower pressure applications, such as carbonators for soda dispensing machines; one of Providence’s initial key industries and product lines that helped the team develop extensive experience with pumps. Rotary vane pumps are also a common design for vacuum pumps, especially in two-stage designs, where they perform such functions as evacuating refrigerant lines of an air conditioning system. Since the vanes must consistently maintain a tight moving seal, mechanical tolerances and material choice are critical for a long operating life and great overall product lifecycle performance. Maintaining tight tolerances and other mechanical specifications, like the k-factor of the spring pushing the vanes, are also of great importance. There are some pumps that don’t rely on rotational motion. One type, the piston pump, uses a sliding piston inside a cylinder. There are actually two main designs of piston pumps: lift pumps and force pumps. Force pumps draw in water through a one-way valve on the inlet when the piston moves up, and expands the empty volume creating a partial vacuum in the cylinder. When the piston moves down and pushes the fluid, another one-way valve located on the outlet opens up and allows the fluid to flow out of the pump. Once the piston has reached the bottom of the cylinder and squeezed out all of the fluid, the piston then moves back up, creating the partial vacuum that closes the outlet valve and opens the inlet valve. Force pumps only push out gas or liquid on the downward stroke, as the upward stroke refills the cylinder. This is analogous to the separate intake and exhaust strokes in a four-stroke engine. Lift pumps refill during the downward stroke, and discharge the fluid during the upward stroke when the piston “lifts”, hence the name. During the upward stroke, fluid is squeezed out the top of the cylinder as the piston travels up. At the same time, the upward stroke of the piston creates a partial vacuum at the bottom of the cylinder that pulls in fluid through the inlet. When the piston makes its downward stroke, valves inside the piston open up, allowing the fluid to pass through the piston into the upper compartment of the cylinder. When the piston travels back up, those valves close, and the volume of the compartment above the piston gets smaller as it rises. This allows the fluid to be discharged through the outlet attached to the upper compartment. One-way valves on the inlet and outlet are also present on lift pumps. The piston pumps manufactured today are often double-acting, which means that suction and discharge happen in both cylinder compartments (above and below the piston). Double-acting piston pumps thus require two pairs of inlet and outlet one-way valves; one pair at the top of the cylinder, and one pair at the bottom. Both types of piston pumps can be driven by hand, motor, or engine and the construction is quite simple and can be built inexpensively. They can be found in applications such as liquid soap dispensers or bicycle pumps. A syringe is also an example of a single-use medical grade piston pump. They are all reciprocating, meaning they pump out the same volume of fluid/air every cycle. Imagine modifying the force piston pump, but instead of the sliding piston increasing and decreasing a chamber’s volume, a flexing diaphragm is what draws in and pushes out the fluid. That, in a nutshell is diaphragm pump. The diaphragm, or membrane, is often made out of an elastomeric material. 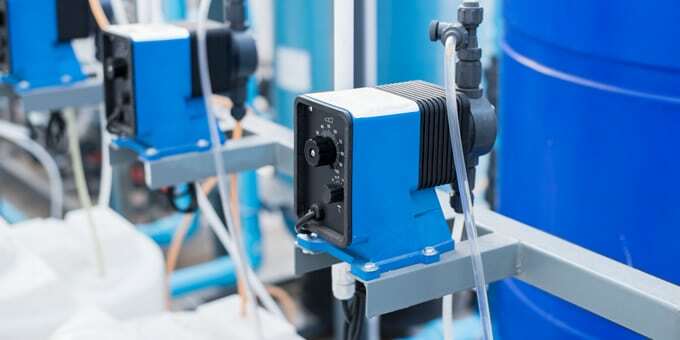 Diaphragm pumps don’t require lubrication, yet operate with little friction and maintain a high-quality hermetic seal with little or no maintenance. The diaphragm itself can be flexed via compressed air, hydraulic fluid or even manually. Since there are no sliding seals like in piston or rotary vane pumps, no oil lubrication is required, which in turn means no contamination from oil vapor of the air expelled from the outlet. This also means that diaphragm pumps are a really good choice for air compressor applications requiring very pure air. They’re a great fit for removing air in low-vacuum applications. Regardless of the underlying design, your air compressor or pump project requires the stringent quality control, pump design expertise and mechanical assembly capabilities from a partner like Providence Enterprise. Contact us today to learn how we can keep your project flowing smoothly from design to mass production!